Wren’s bright red mountaineering boots seemed to glow even redder under the beam from my headlamp. The tune of an unknown Chagga song, sung in Swahili, floated in the night air. 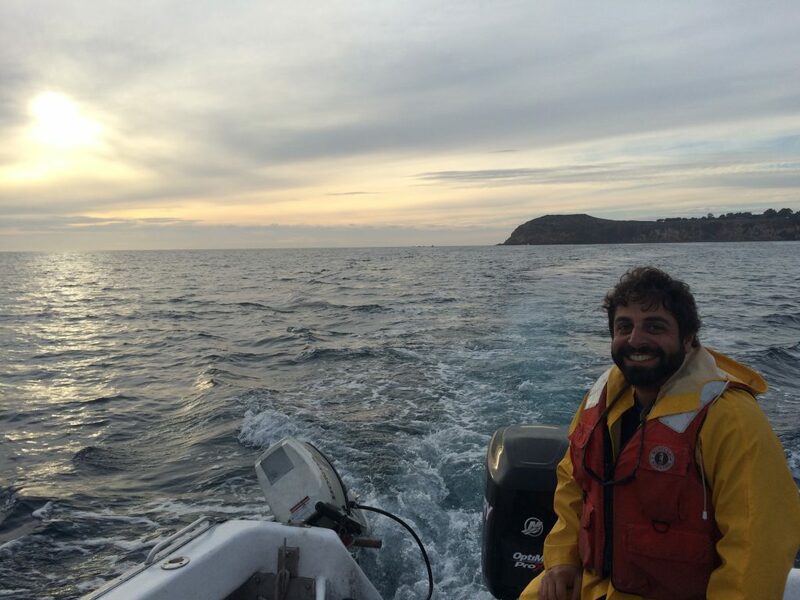 I couldn’t see my breath condensing through my balaclava but the fabric on my face was wet and cold. My throat was starting to dry from my repetitive deep breaths, causing a bland cottony taste in my mouth. 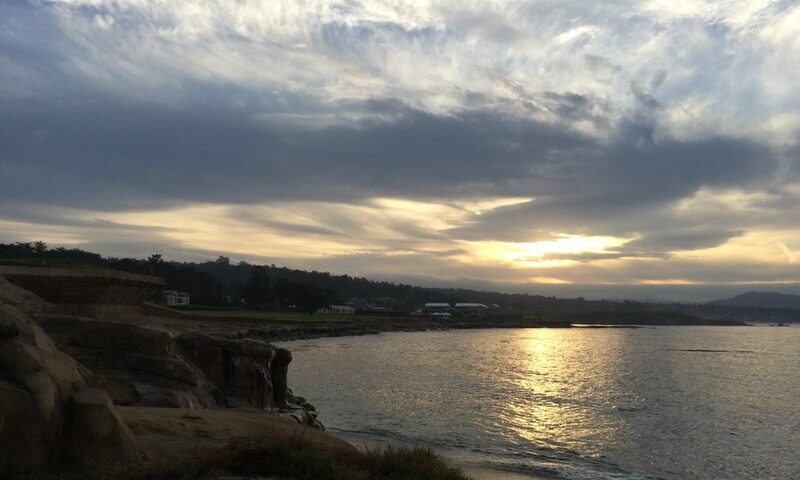 But curiously, there was no smell – no wet rock or soggy earth or crisp mountain air. As we passed 17,500 feet, I remember wondering where the smells of Mt. Kilimanjaro had gone. It was the fourth day of our trek along the Marangu Route of Africa’s tallest mountain and we were trudging up an endless number of switchbacks taking us from 15,500 to 18,700 feet in less than two miles. My older brother, Peter, and I were part of 16-member REI Adventures group from across the United States, including Wren and his wife from Seattle. 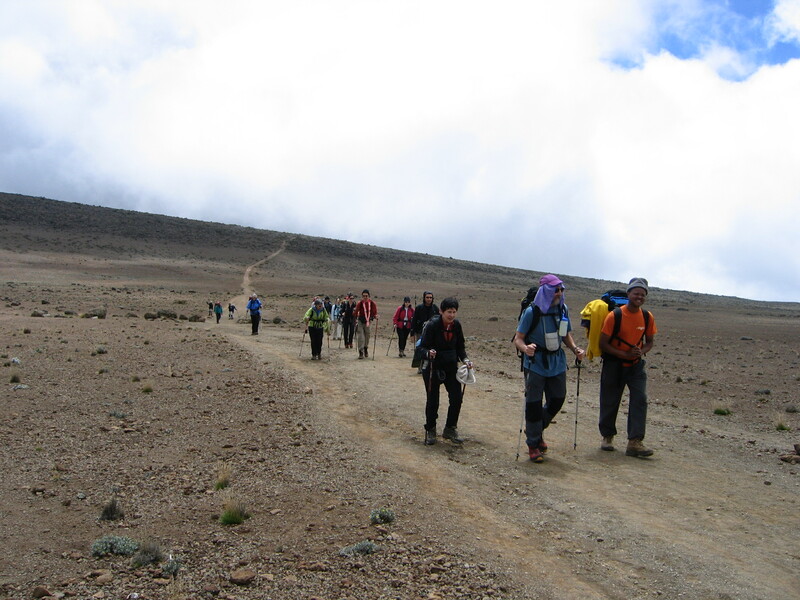 We were all bound by a single goal – to stand on Uhuru Peak at 19,340 feet. Tonight’s summit attempt started at 11:00 p.m. with headlamps and stars lighting our path. The transition from rocky trail to icy scree and snow-covered boulders was a dim memory from only hours earlier when Peter puffed out, “You want to take a break?” As we shook the ice from our frozen water bottles, we watched a procession of yellow and white lights from climbers on the trail below us. The climbers were in small clumps meandering up the slope – here were seven lamps heading to the right, there were nine crossing to the left – with the resulting light display looking like a haphazard LED dance. Above us, the groups were harder to distinguish with boulders blocking the lights but the mountain face was framed by stars. Mt. 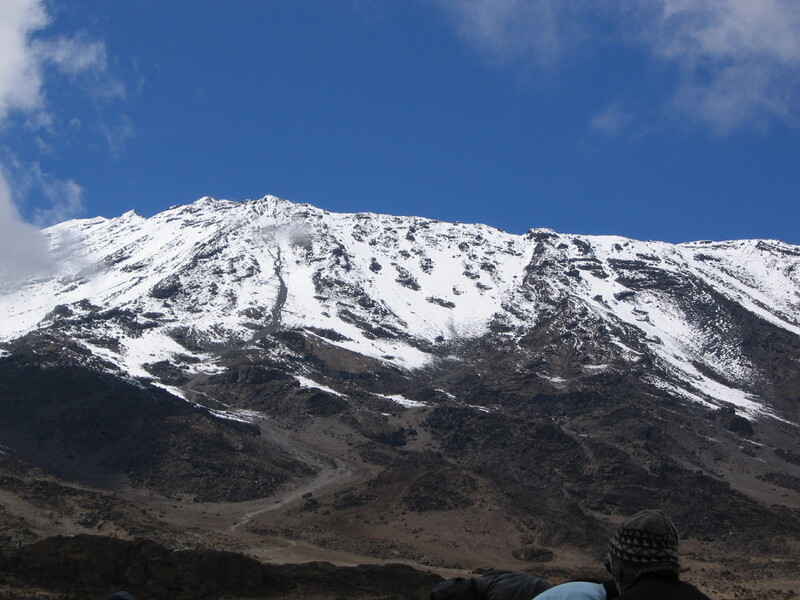 Kilimanjaro emerged as a yardstick of global warming in the late 1990s with cautionary claims about the impending demise of its glaciers. The sensationalism of Africa losing its last vestiges of mountain ice seen in Al Gore’s “An Inconvenient Truth” accelerated tourism to climb the mountain more than Hemingway’s “Snows of Kilimanjaro” could ever have done. Increasing public awareness of global warming provided a powerful marketing tool and, annually, 30,000 people are funneled to Tanzania by the adventure industry. 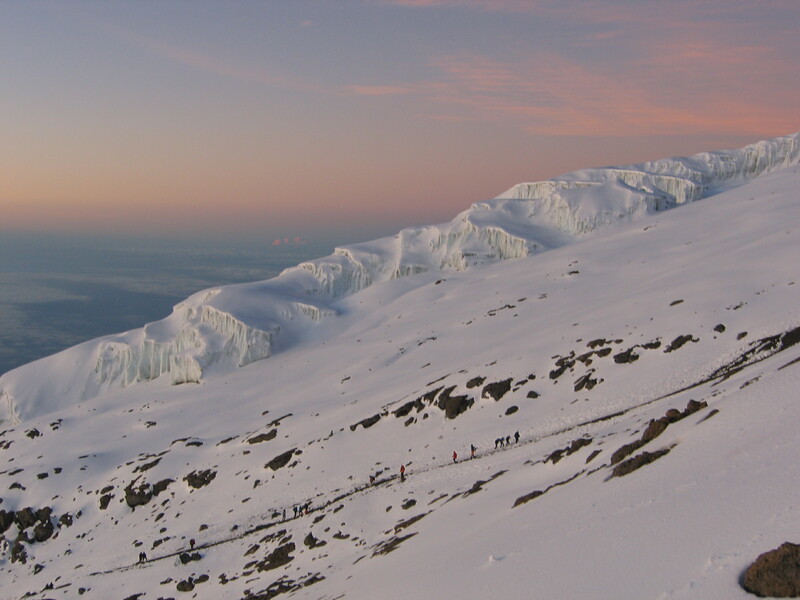 Similar to Yosemite National Park, Peru’s Inca Trail and Australia’s Great Barrier Reef, the glaciers on Kilimanjaro could be considered a phemonemal natural spectacle that is being loved to death. I will admit that I was seduced by the magazine cover stories and newspaper articles purporting that by 2010, the peak would be barren rock. Selfishly, I wanted to touch the 10,000 year-old ice and someday tell my grandchildren about the days when eastern Africa once had a mantle of something called glaciers. We were lucky. 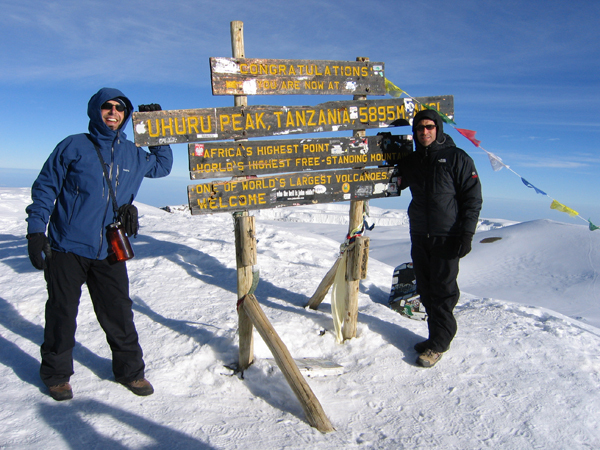 December 2006 had been an especially wet month in Tanzania and, since we were climbing in mid-January 2007, the snowcap stretched down to 16,000 feet. The peak had loomed white and shimmering when we caught our first glimpse days earlier. The clouds that shrouded it on occasion magnified the mystery about the snow. How thick would it be? What would we do if we needed crampons (we were told we didn’t need to bring any)? Could my brother and I indulge in snowball fights harkening back to winters spent at Mammoth Mountain? Now though, we were surrounded by the recent snow, and we could see that the drifts would melt in some weeks, having even shorter longevity than the coatings on the San Bernardinos or San Gabriels in Southern California. We started hiking again but each step was more of an exertion than the one before. Half of me wanted to sprint and get past this pain so with a gargantuan effort, I tried to kick into a higher gear. Just as I did this, a deep rumble from Moses, one of our guides, penetrated my head, “Pole, pole, Snoop Dougy Doug. Pole, pole.” In Swahili, pole, pole (pronounced po-lee, po-lee) means “slowly, slowly” but on Kilimanjaro, it means “You seriously think you can go faster? Are you kidding?” The day before I had nipped at the heels of Moses like an eager puppy so he blocked the trail to prevent me from passing him and, in a near whisper, told us “Pole, pole.” But now, with a few thousand feet to go and already fatiguing, I turned to Peter and grumbled “I got your pole, pole right here,” only to be winded from saying that. As the trail steepened and the snow patches merged into broad white flanks, the Swahili songs our lead guide was singing began to fade under an onslaught of Japanese, German and British voices. We were being passed by the smaller, more nimble groups and soon, a cacophony of half-dozen languages swirled around our heads. The groups merged into a long organic snake of climbers that shed people who couldn’t maintain the suddenly quicker pace. A panicky sense gripped Peter and me when we realized we were separated from our group. We managed to use our boxy frames so the two of us wouldn’t get parted. Yelling matches erupted around us as husbands tried to stay close to wives. The icy air and frozen snow vibrated with the constant thumping of dozens of feet, all the while my eyes squinted ever more from icicles binding my eyelashes together. When the trail devolved into a semi-vertical scramble, I heard Peter chuckle-pant-chuckle-pant-pant at my gracelessness when I scampered belly-first over the boulders. Never slacking on the pace, we stuck together until the 10,000th left turn and stumbled, somewhat surprised, onto Gillman’s Point, the rim of the Kibo Crater and end of the steepest vertical section. The spot was in a riot as people yippeed, gasped and called out to find their climbing partners. The roar was deafening. We had another 800 vertical feet to get to Uhuru. The coldest possible African sunrise was beginning as we regrouped and began the final hour of our ascent. Our hiking boots slid on the packed snow that blanketed the ridgeline as we trudged ever slower upwards. Soon we could see climbers ascending from some of the other seven routes. Since I’ve returned, I’ve noticed how en vogue it is to downplay the Marangu Route (the one we completed) as an “easy” trail and portray the Machame and Shira Routes as “real” climbs. Well, nothing feels “easy” at 19,000 feet. All my training in the Sierras was child’s play and I’ll guess that regardless which route taken, anyone would have noticed that the air seemed to be missing. As the rising sun backlit Mt. Mawenzi, Kilimanjaro’s uber-technical jagged second highest peak, and illuminated the African savanna below, Peter and I slung our arms around each other’s shoulders and stumbled to the unassuming wooden sign declaring that we now stood at 19,340 feet. The blue ice of the Furtwangler and Diamond Glaciers and the Southern and Eastern Icefields sparkled and added some tranquility between my shallow breaths. Of course, high altitude tranquility has a new meaning – wind-beaten ears, raw nose, soggy lips and spaghetti for leg muscles. But with the fully-risen sun painting the clouds, which were below us, I no longer cared that there were no smells on Kilimanjaro. The hardest part of our 40-mi roundtrip hike was over, but the 2-day descent taught me the value of trekking poles. We looped back on our trail through snow, then loose scree, barren dirt, low slung heather and steamy moors, and finally tropical rainforest. Gravity did most of the work but we had to put on the brakes frequently to step aside for porters ascending with clients’ gear trekked upwards…and for the clients who puffed along miles behind. Is that how we had looked just days before – red-faced, wide-eyed and camera-happy? You bet! And that’s also how we looked back in Arusha toasting our climbing partners with Kilimanjaro Premium Lagers with labels that have glaciers that will never melt.